Energy efficiency is something that tops the list in a construction project. Why is energy efficiency so important? Because, resources are fast depleting and we are consuming energy resources like oil, coal and gas, five times more than we should actually be consuming. In the United States of America, buildings were the biggest energy guzzlers as they consumed 49% of the total energy produced—based on reports by Environment Protect Agency (EPA). However the industry understands the gravity of this situation and has already started moving towards developing an energy efficient future via green building design philosophies and methodologies. 13 – EcoDesigner STAR by Graphisoft compares favorably and reliably against other energy analysis software that meets ASHRAE 140 standard. Such tools are arming architects earlier in the building design phase and can contribute substantially to LEED scoring optimization. Rating systems such as LEED have brought in this significant change and the most effective means of earning credits is via whole building energy simulation modeling. Using energy modeling software tools like eQuest, it is possible to create a 3D virtual building environment and further analyze energy performance for various design options. LEED credits can be applied for all project types, including new building design and construction, interior design and construction, and maintenance and operation of both new and as built facilities. A green building proposes significant values to owners and occupants both, as it promotes a healthier and cleaner environment. Not only that, prudent use of energy and other resources such as water, also reduces your carbon footprint. 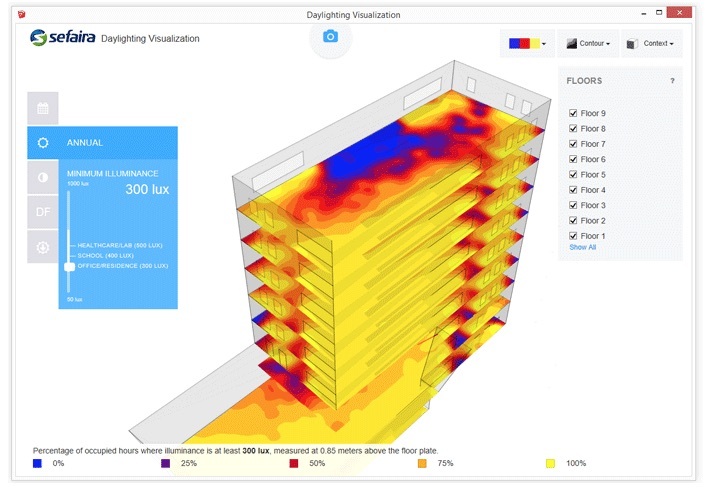 02 – Sefaira’s sophisticated energy analysis software also calculates daylight analysis functions, a critical factor in optimizing a building’s lighting design scheme and its impact on building energy footprint. Whether you have an existing building or you have a new construction project, if you wish to reduce the utility bills and get the building LEED certified, energy modeling is the answer. However, remember that software is just a tool, the real benefits are derived from the kind of inputs and information that is fed into the model. All simulation based analysis work requires the most accurate and validated information, and here the principle of “garbage-in-garbage-out” holds true. Hence firstly, put in highly accurate and verified information into the models and second, ensure that you engage the right kind of firms and experts to conduct whole building energy simulations and analysis for you. A greening future is in the offing and the wave of NZEB’s gripping the world. So be ready to embrace technology that lies at the forefront of developing buildings that are beautiful and greener in every way. Bhushan Avsatthi is an Associate Director at Hi-Tech Outsourcing Services. Bhushan imbibes the philosophy of efficient and prudent use of energy in his day-to-day life and advices his team to do so as well. He is also involved in green initiatives like nonprofit tree plantation projects and promotes using bicycles for commuting small distances. Bhushan, handles a team of architects, structural and MEP engineers, LEED consultants and Energy modeling experts.